Some call it “the new Berlin”, but I think Lisbon has plenty to make it stand out by itself – no comparisons needed. Friendly locals, plenty of affordable fresh food and a great co-working and cafe scene that will make you feel like being productive. 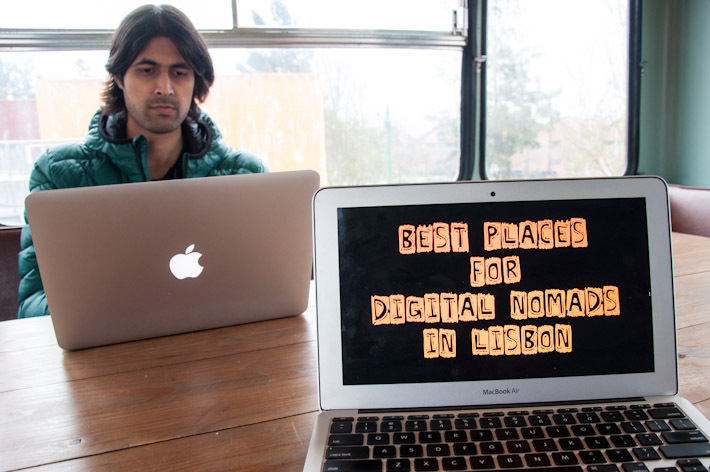 In this article, we aim at recommending some of the best places for digital nomads to work in Lisbon. Even though WIFI comes as a first requirement when you think about these types of spots, it’s not only about being online. You can get free WIFI in most mall food courts, cafes or McDonald’s. Or even get a 4G mobile connection for about 20Euros, that will give you a generous 5GB to work with. The places we’re covering here are about more than just WIFI. They are places that offer comfortable seating for those looking to lounge around for more than a couple of hours. They are conveniently located and accessible by public transportation. 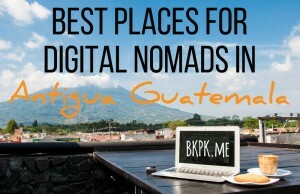 They all have a good atmosphere where you can actually get work done and, some of them, also present themselves as good spots for networking with other digital nomads and local entrepreneurs. There are many co-working spaces in and around Lisbon. In this list, we’re only featuring the ones we have used and would recommend. Please note that there may be other worthy spaces but the ones mentioned here are those that offer day passes. Spots with a minimum commitment of one month have been excluded. Because we know that, just like us, not everyone stays in one place for that long or prefers to head to a co-working space on a daily basis. Coworklisboa is an open space located in a renovated building of the hip LX Factory. This artsy, commercial and office area serves as an ideal location for a co-working space. It’s great for meeting people and networking as well. Also, it’s a good working space for those who like to take breaks and enjoy a little change of scene, having plenty of options to have coffee or a bite downstairs. 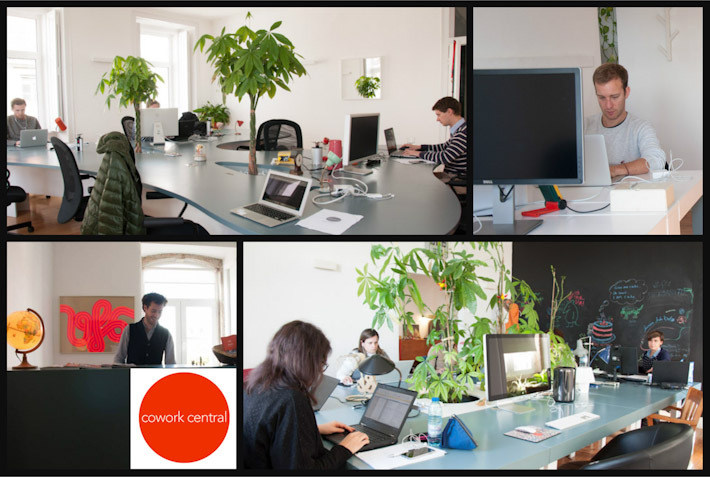 Coworklisboa houses a mix of permanent residents and coworkers occupying flex desks. Nomads visiting on daily passes are accommodated on a long communal table. The table is spacious and the office chairs are extremely comfortable, with a good number of plug-points too. You can easily sit here all day. The community spirit is well felt around here – thank the open space for that, as well as the communal kitchen where you can enjoy free coffee, or the adjacent cafe where co-workers often have a bite together. Great vibes and an inspiring location – it’s easy to understand why this place is one of the most popular co-working spots in Lisbon! Where: Rua Rodrigues Faria 103, Edificio I, 4th Floor – LX Factory. Near Largo do Calvario in Alcantara. Timings: 9AM – 9PM during week days. Closed on Saturday and Sunday. Goodies: Free coffee and use of communal kitchen. Free open air parking – a rare treat within Lisbon! This is a happy and sunny co-working space situated by the easily accessible Cais do Sodre, offering excellent views towards the river and the South Bank. This is a perfect location, whether you’re traveling by train, bus, metro or tram. Cowork Central includes different spaces, with a mix of local entrepreneurs and walk-in digital nomads (pets are welcome too!). Visitors can choose one of the different working areas available (between 4 to 10 people or so). Once locals seem to have their preferred spots, it’s more likely for visitors to get to know one another and network at the small communal kitchenette, lounge or balcony. I tried the newest room with a massive curvy table: as it is not straight, the table gives a lot of privacy to each coworker, as each person gets his own corner, while enjoying plenty of natural light, individually adjustable table lights, a comfortable working chair, a great number of power outlets and speedy internet. Cowork Central is a modern space, with all the tools one would need to get some serious work done! Timings: 9:30AM – 9:30PM during week days. Closed on Saturday and Sunday. Set in a completely different side of town compared to most co-working spaces in Lisbon, IDEIAhub is a good alternative for those near Parque das Nacoes. The area is accessible by metro, bus, and train. The environment here feels more corporate but not necessarily formal. Local entrepreneurs outnumber the nomads doing daily walk-ins, even though we’re told that the latter is growing lately. IDEIAhub encourages collaboration between resident and visiting coworkers. They indeed have more variety of co-workers than other spaces. Apart from the usual techies, they also host companies working in F&B, accountants, lawyers, psychologists and even a small beauty lounge with manicure services! There are excellent natural light and gorgeous views of the river and Parque das Nacoes, as well as appropriate artificial lighting. Coworkers on daily passes use high tables – for me, the laptop would end up at a height similar as if I’d have put it on a stand. The chairs are also bar high and fairly comfortable, but not as much as the office type of chairs in the regular lower desks. Those desks can also be used if free, and in both cases, you have access to great WIFI and plenty of plug-points. There’s a lounge with couches and video-game consoles, and a small pantry to eat what you bring or what you get from the F&B cart that visits the offices twice a day. Downstairs, there are plenty of places you can go to for coffee or food, as well as a shopping mall just 3 minutes away walking. 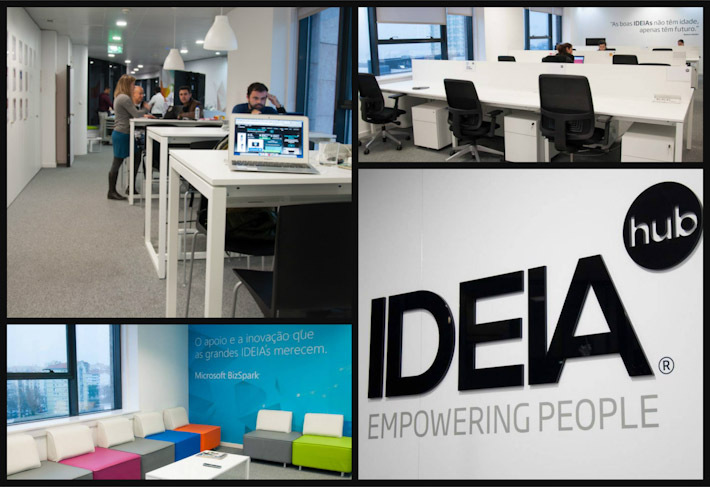 IDEIAhub is a space for those whose productivity gets fueled in an organized and contemporary environment. Timings: 9AM – 6:30PM during week days. Closed on Saturday and Sunday. Goodies: Espresso coffee at 25cents per cup. Surf Office Lisbon is not only a co-working space. It is instead a guesthouse, offering accommodation to digital nomads who visit Lisbon from all over the world. Apart from serviced rooms and shared facilities, nomads get to work with like-minded people in a small but well-equipped space that is open 24/7. Think of Surf Office Lisbon as co-living, but better! Instead of having to share home responsibilities with your flatmates, you pay for a room just like you would in any hostel or guesthouse, but you get the advantages of living under the same roof as other digital nomads, while the maintenance of the place is taken care of. The cowork area is gifted with plenty of natural light, while nomads work on a long communal table that offers plenty of space per person, as well as power outlets, some external screens for those who may need them, and free coffee and tea to keep you going. Apart from work, Surf Office Lisbon promotes a fun atmosphere. Work hard, play hard may not be their motto, but it sure feels like it applies here! They organize activities depending on the guests that happen to be in at a given time – this includes, of course, surfing trips! I got the feeling Surf Office knows the highlights of a stay in Lisbon (quality of life, great weather, proximity to beaches, etc.) and they do a great job at sharing that with nomads who choose to stay here. Every now and then, Surf Office Lisbon also hosts work-related events for its visitors, like their upcoming Instagram workshop. If you like to work and stay in a happy, chilled-out place, book yourself into Surf Office Lisbon! Prices: 50€/single room; 60€/double room; 75€/twin room. Shared bathroom. Use of co-working space included. Goodies: Free coffee/tea. Projector, printer & LCD displays. 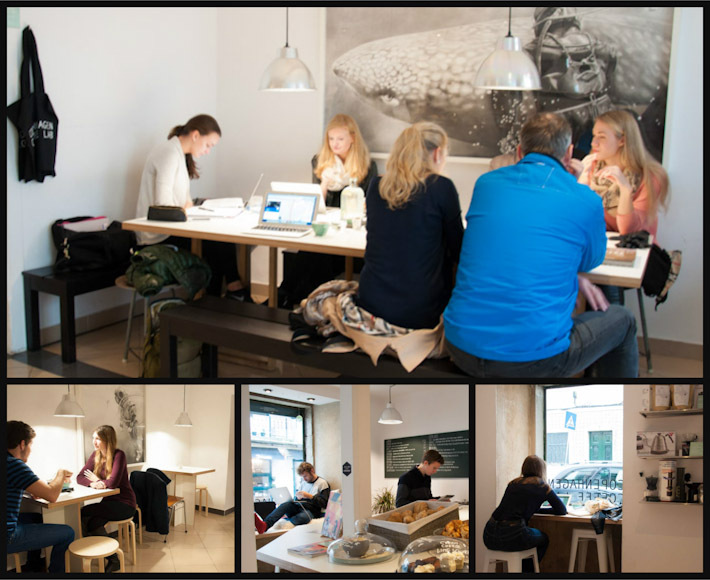 The moment you enter Copenhagen Coffee Lab, you know this is a place for digital nomads. You are welcome to order a cup and sit around for hours, like you see several people indeed do. The atmosphere is very foreign around here – if it weren’t because this cafe is nestled in one of those typical Lisbon squares, you could almost forget that you’re in Portugal. Apart from tables for 1 or 2 people, there’s a large communal table where digital nomads tend to sit at. Unfortunately, the seats in this one are benches, not chairs, so there’s no back support. For those more inspired when they observe the world pass by, there are also seats by the windows. Wherever you choose to sit, you’ll find a plug point fairly close to you. There’s a good mix of natural and artificial light, particularly over the big the communal table, which can seat around 8 people comfortably. It is a little noisy by the entrance as the door is kept open and cars pass by the street all the time, but you can choose to go inside and have more privacy. Apart from excellent coffee, Copenhagen Coffee Lab also serves sandwiches, pastries (Danish, not your usual Portuguese ones), cakes and other healthy bites such as oatmeal. Jugs with water and lime wedges are available for free too. Very good internet, mighty fine coffee and plenty of other open laptops all around you make Copenhagen Coffee Lab a great spot for digital nomads in Lisbon! Where: Rua Nova da Piedade 10 – near Principe Real. Prices: Specialty coffees between 1€ and 7€. Timings: 8AM – 6PM, Monday to Friday. 10AM – 6PM, Saturday and Sunday. A twin of the cultural and artistic project Village Underground in London, VU Lisboa houses working spaces for artists and a cafe where you can also sit and work at. Here, we’re focusing on the cafe, while you can find more info about renting spaces and co-working on their website below. There’s nothing usual about Village Underground Lisboa. 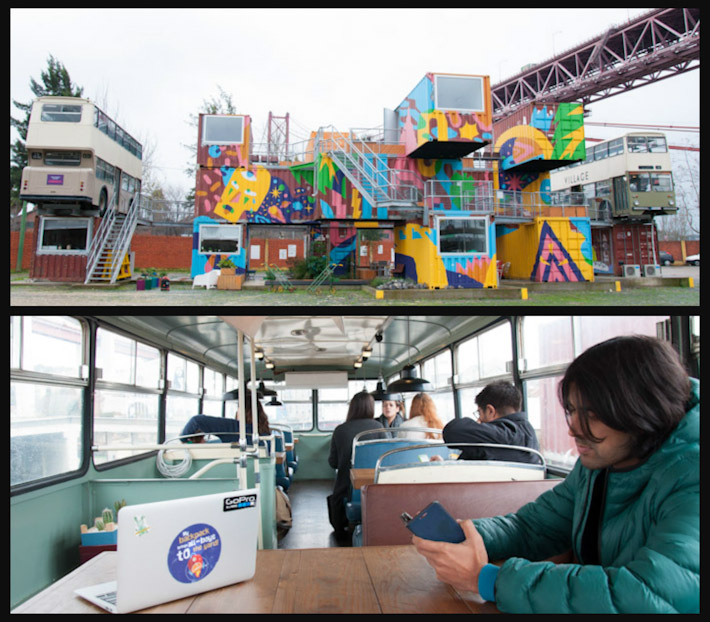 Next to the containers turned into workshops for artists, you’ll come across a cafe housed in a double-decker bus – VU Lisbon is set inside Carris Museum, that is, the local company that manages urban buses in Lisbon. So it all makes sense! While Village Underground itself is open 24/7, the cafe is mostly open during the afternoon. They serve a dish of the day, some snacks, and a decent variety of freshly made juices, tea, and coffee (Dolce Gusto capsules). We worked on the 2nd floor of the bus (which can shake slightly if the wind happens to be strong) – there are tables for 2 and a larger table for a small group of 7 or so, and, against all odds, the bus-style seats are actually very comfortable. The natural light is great and you’ve got the advantage to be able to close your own portion of shade if you need to cancel some light because of the reflection on the screen. On darker days, there’s also good artificial light above each table. There are power outlets by nearly every table, so recharging is not a problem. Overall, I found this place to be surprisingly comfortable to work at. The location might not be obvious, but that doesn’t mean it’s not easy to get to. From Largo do Calvario you walk a few minutes to Carris Museum – once you reach the reception, they’ll direct you towards this space. Those inspired by quirkiness will love to work at Village Underground Lisboa! Where: Museu da Carris, Rua 1º de Maio, 103 – close to Largo do Calvario in Alcantara. The world has Starbucks and Lisbon has Padaria Portuguesa. 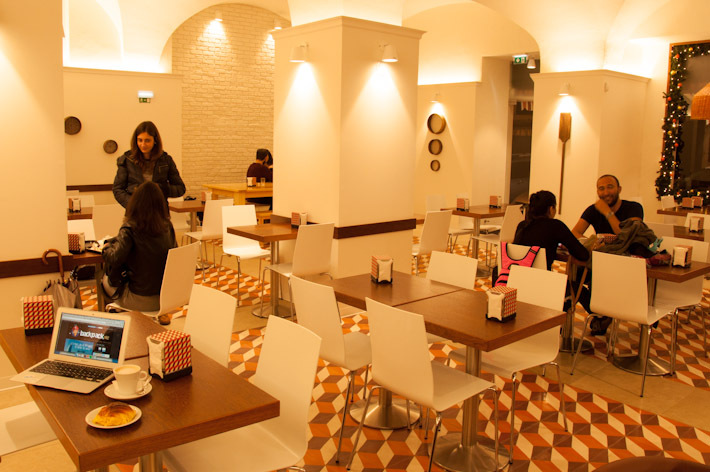 This chain of cafes mixes the best of Portuguese style coffee shops with a contemporary feel. There are many Padaria Portuguesa outlets all over Lisbon (you’ll see them easily near touristic locations), but the one reviewed here is the Cais do Sodre store. While the menu and WIFI seem pretty standard across the different shops, the seating area may vary. Cais do Sodre is busy enough to be happening, but not too busy that will spoil the possibility of getting some work done. Apart from standard cafe chairs, tables, and some small couches, Padaria Portuguesa in Cais do Sodre also has one big communal table surrounded by two benches, ideal to work in a group (up to 8 people). This is a self-service cafe, and the seats are not near the counter. As such, you can lounge in the area for as long as you want, and no one will bother you or pressure you to order more food/drinks. There are several power outlets in the cafe and good artificial lighting. The WIFI is not stellar (you wouldn’t be able to do a conference call, for example), but it’s good enough for most blogging related tasks, checking emails, social media, etc. for example. Where: Rua dos Remolares, 17 – in front of Cais do Sodre Station. 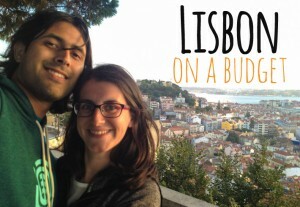 Fabulas is a good spot for digital nomading in Lisbon, but it’s not for everyone! Those into alternative, vintage looking places, might feel inspired here. We sure weren’t the only ones with a laptop, book or pen and paper in hand around here. Set in the very center of town (Baixa-Chiado), Fabulas is more of a bistro than simply a cafe. But the space is so big and divided into different rooms, that you can easily find a corner to sit at and work for hours, without having someone bothering you. There are small and big tables, and some couches too. Just don’t expect good natural light though. There’s also a pleasant outdoor area, but WIFI there can be sketchy. Coffee is mediocre for Portuguese standards and the prices are a little high (even though the menu does offer unusual creations), but the fast internet may make up for that. If you want to explore downtown Lisbon and still get some work done on the same day, stop by Fabulas! Where: Calcada Nova de Sao Francisco, 14 - in Baixa-Chiado. Prices: Regular coffees between 1.2€ and 2€. Timings: 10AM – 11PM, Sunday to Thursday. 10AM – 1 AM, Friday and Saturday. If you’d like to work at a place where smoking is allowed, swing by Livraria Ler Devagar. 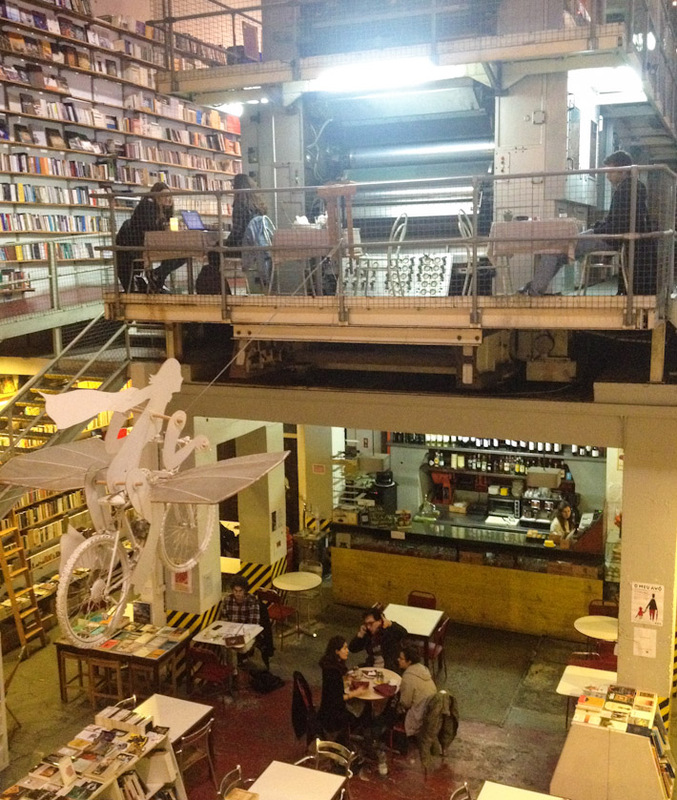 This bohemian bookshop set in an abandoned printing press is home to two different coffee shops where smoking doesn’t seem to be an issue. If you don’t want to pay for a co-working spot or having to order something to eat or drink at a cafe, heading to a local library to work can be a good option! You do not need to be a member of any of the municipal libraries in Lisbon to walk in, sit down and use the WIFI. The passwords are normally written down on a notice board by the entrance. 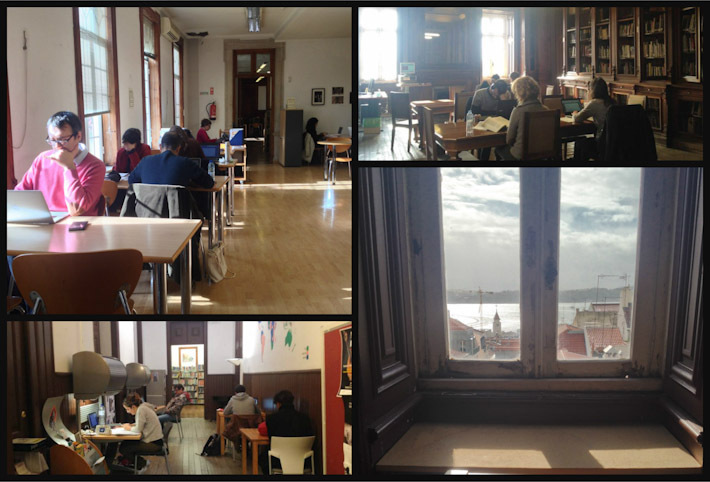 Biblioteca Muncipal Camoes, near the popular Bica lift, is a good spot for working in downtown Lisbon. There are plenty of individual and communal desks, silent areas and rooms for group work (where you can talk), and even some desks by the windows, with truly privileged views over the red terracotta roofs of Lisbon and the river. There’s a mix of modern typical library looking rooms and some others more historical, with intricate ceiling designs. Here, you’ll come across many people studying or working with their laptops, but don’t expect any socializing as such. You come here to do your own thing, that’s pretty much it! Check the complete network of public municipal libraries in Lisbon offering free WIFI here. Timings: 10:30 AM – 18PM, Tuesday to Friday. Some Mondays and Saturdays open too: check website below for timings. If you have any questions regarding the spaces listed here, feel free to ask in the comments. If you’ve worked in any of the above too, don’t forget to add your thoughts! 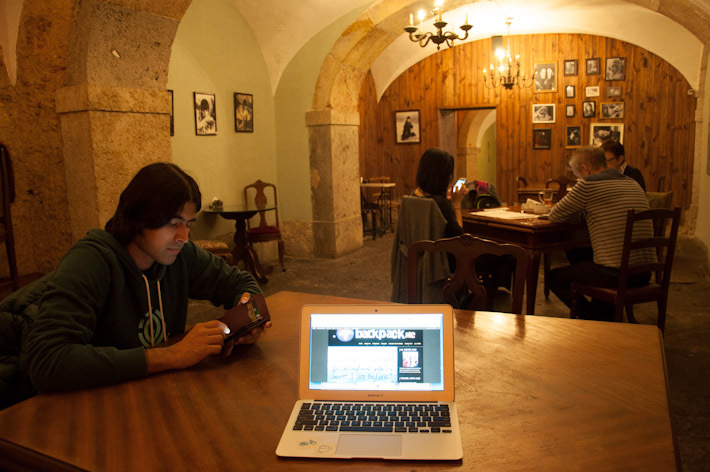 Booking co-working spots all around Lisbon is made super convenient with the app Croissant. A great way to reserve a spot at and use a coworking space in Lisbon and other cities across the globe! Let us know what you think of Lisbon! Wow, great list! 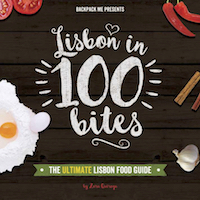 I spent a month in Lisbon last year and didn’t find any of these places! Also, I’m surprised how many co-working spaces the city has. Clearly I need to get back there! Lisbon has TONS of co-working spaces and new ones keep popping up all the time! These are some of the best, and my preferred ones because you can access them on a daily basis without too much commitment. I hope you consider Lisbon again as your base for a little while! Cheers! Awesome post!! 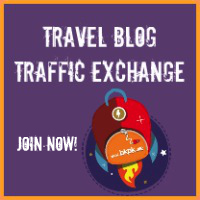 I need a post like this for everywhere I travel!! I am related to IT and do freelancing and want to settle in Europe, now after reading your post I will consider moving to Lisbon. I want to know Ashray that what is your source of earning and how did you manage your traveling expenditures. So timely! We are coming to Lisbon by the end of February for 3 months. This list is awesome and would be very handy. You saved me time on research. Thank you. Cheers! Thanks for this post, very informative and really helps a lot, Waiting for more post like this :), Great. Hi! I will be headed to Lisbon this May for a few days and am on the search for a coworking space that offers private (preferably soundproof) rooms as I teach English online and don’t want to disturb others sharing a common space! Do any of the places you’ve been to happen to fufill that need? :-) Thanks so much for your assistance! This article seriously rocks – my boyfriend works virtually and is SUPER excited about ALL of these options. I am not sure if you already found a coworking space with soundproof booths or not. I am not sure which one has them. If you’re still looking, maybe it’s a good idea to ask around in the Lisbon Digital Nomads group on Facebook! Good luck and enjoy the city! You may want to take a look to this co-working space called Workup with an excellent location both for those who want to develop their academic work, professional or business activity. Has great access it is located at Rua Tomás da Fonseca 40A. Workup also provides flexible solutions that can start with just one virtual office. If for now you only need an address to receive your correspondence and an administrative service to meet and make call transfers, or register errands, we have the ideal solution. If you want to use the meeting room or training room occasionally, you may do so by making a reservation according to availability. Are there any co-living places too? Looking to stay for a week. You could check out Surf Office (mentioned in the article), for example. They are a co-working and co-living space. 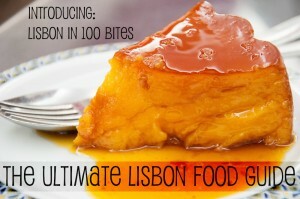 Alternatively, for a week, I’d suggest checking out posts folks share on the Lisbon Digital Nomads facebook group. Those may not necessarily be “official” co-living spaces, but there are other DNs looking to share a place all the time! Last, but not least, we’ve got a pretty happening meet-up going on every Thursday if you wanna come and hang out – details here! Enjoy Lisbon! @zara – Super helpful, thank you! 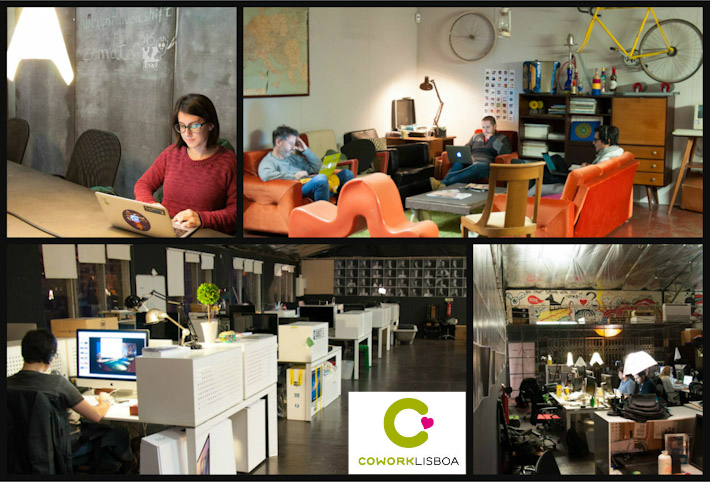 What a selection of coworking places in Lisbon! Thanks for doing all this research. I’m headed to Lisbon next month and I’m trying to find the best place to situate myself. The city looks so amazing, I’m excited to check it out! Join us for the DNs meet-up when you’re in town. It’s a great event and the ideal place to meet fellow nomads.